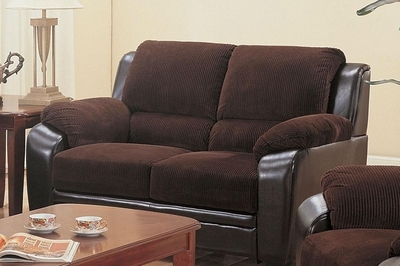 Snuggle up with a loved one in this comfortable and stylish loveseat. 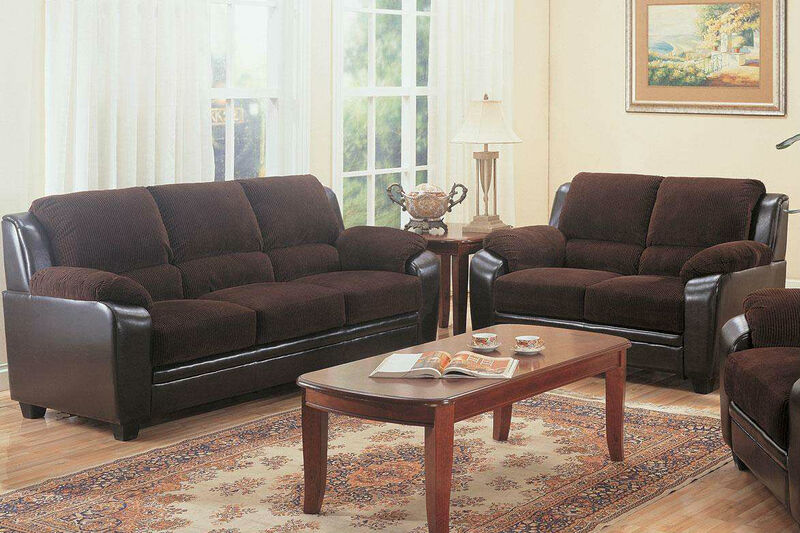 Soft and supportive, this two-seat sofa offers thick boxed seat cushions, pillow-top arms, and plush channel-tufted back pillows for exceptional comfort and effortless support at every angle. With its unique two-toned upholstery featuring a corduroy fabric on top and a sleek brown vinyl on bottom, this item is bound to catch your eye with its charming casual-contemporary style. Framed by crisp lines and tapered wood feet, this loveseat's versatile design can be used to dress up or dress down any occasion. Whether standing alone in a tight area of the room or paired with a full-length sofa for a complete living room ensemble, this loveseat is the ultimate home accessory.